Surveying acclaimed works that have effected social change; Unveiling new large-scale public murals. 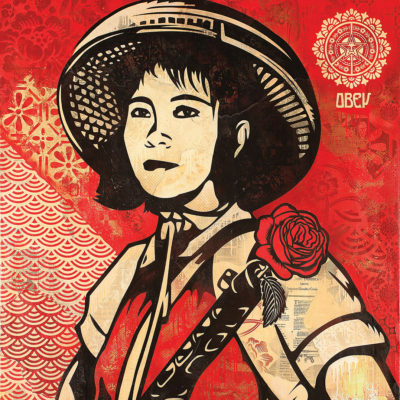 Hong Kong Contemporary Art (HOCA) Foundation is proud to present “Visual Disobedience,” a large-scale survey exhibition of American artist Shepard Fairey for the first time in Hong Kong. The show explores the trajectory of Fairey’s career focusing on the theme of power and responsibility, contemplating the wide-spread abuse by positions of authority, and the response this exploitation solicits. The show runs from 27 October to 27 November 2016 at Shop B104 – Shop 305, The Pulse (No. 28 Beach Road, Repulse Bay, Hong Kong), and will also feature new large-scale public murals, inspired by Hong Kong and China.